It’s a fairly common debate these days in the Zelda Community: Should Zelda be linear or open? I’ve talked about it before, and I think I’ve made my stance very clear: A non-linear, branching game is best. I’ve mostly received agreement. People agree that is no reason why an adventure title like Zelda should be restricted. Why should I have to follow a very linear path, from Point A to Point B in a strict order, when I’m playing a game where I’m supposed to be adventuring? Doesn’t that kill the sense of adventure? In the past, Zelda games have featured a generally intended path, but allowed deviation. This is something both A Link to the Past and Ocarina of Time did, and it worked perfectly. The one major argument against a non-linear game is the story. Two linear Zelda games frequently cited as examples are Twilight Princess and The Wind Waker. While some believe Twilight Princess’ story did not excel in comparison to other games, I’m of the opinion that regardless of my feelings about the story itself, it was told especially well. While not usually credited in the same way, I also feel that The Wind Waker was another game that excelled at the storytelling in this way. But here’s the real question: Did either of these games need to be linear to accomplish this? I don’t believe they did. Take The Wind Waker. This game had a slightly more unusual structure compared to the other games in that while the game had two halves like usual, each half had only two dungeons, with the Tower of the Gods representing a static turning point in the plot. For the most part, however, linearity was unnecessary. This is especially in the second half; why did we really need to complete the Earth Temple before starting the Wind Temple? A slight tweaking of the early game structure and it’s possible to make it so that Dragon Roost Cavern and the Forbidden Woods can be done in either order too. The stories of each area are practically self-contained, so there was no reason to set up this barrier. To be fair, the game was very open once you completed the Forbidden Woods; only the story was linear. The Wind Waker does seem to provide a fair argument against my point, however, in that it was a great experience. It contained a linear story, but the exploration and optional material branched out enough that the linearity wasn’t overly noticable, and several major challenges could be completed in any order. I still believe that if the developers had added more openness to the story, it would have been even greater, and I also tend to resent that the idea of a more open game has been ignored since the early titles. Twilight Princess was much more linear. In this game, the plot was directly connected to Link’s partner, Midna. 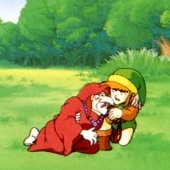 Due to the fact that your partner was one of the story’s most significant characters, and that most of the plot was told through her interactions with Link, it was more difficult to tell the story in a non-linear fashion since they were always together and the events happening around them shaped the plot. A lot of the story involved Link and Midna growing closer as their adventure wore on, so a linear progression of events is necessary to convey this, right? Well that’s the argument, but again I don’t agree. Let’s start with the first half of the game. You’re collecting the Fused Shadows. Midna is still a largely mysterious character, almost sinister in some respects. Actually, at this point in the game there is very little character development between Link and Midna, so there really was no excuse here. Different areas had distinct, individual stories, so the overall story could easily progress in any order. The major events unfold around the Ordon Kids, but even that could be handled differently. What if the gamer were given the option to go to either Eldin or Lanayru Province first, and deal with either place’s particular troubles? While encountering the kids in Kakariko AFTER meeting Ilia in Castle Town could change things, is that a bad thing? A slightly branching path in which events are slightly different when experienced in different orders is neither hard to implement, nor destructive to the story. Thinking outside the box and implementing a non-linear progression could have expanded and strengthened the story rather than restricting it. The other problem with Twilight Princess is that even the side-quests and collectibles were very linear in a sense as the items you could acquire and the places you could go to were extremely limited at any one point in the game. This is unnecessary no matter how linear the dungeon order and story is. It is merely bad game design. In an adventure game, you should be able to explore at your leisure; that’s been an overriding principle throughout the Zelda series, and there was no reason to remove this freedom. Hopefully you’re starting to see my point. What is the problem with constucting the events of the game in such a way as to allow at least the dungeons and side-content to be experienced in a somewhat flexible manner? If Nintendo can add to the experience and replay value of a game without sacrificing the story, and if in some cases this would strengthen the story, why not do it? While good Zelda games continue to be produced, this issue has yet to be addressed. 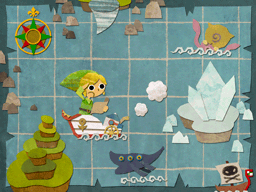 Phantom Hourglass and Spirit Tracks were both fairly linear affairs, although they were a bit more like The Wind Waker in that they offered more in the way of exploration. Even given the freedom these games offered, they were not open enough. Linear games in the series are fine on occasion; experimentation is great. But for a series that has its basis in exploration, there isn’t much of an excuse anymore. Now, with all this said, two things do need to be acknowledged about the argument for linearity. First, even in the games that we acknowledge as non-linear, like A Link to the Past, there’s still a heavy level of linearity in that you’re only allowed so much free-reign before eventually being forced to a set objective. What I refer to as being open is realistically only partially so, but that’s logical in any game except sandbox titles. Secondly, there are some who believe the story in Zelda has never been that great. I personally disagree, but I suppose it depends on your interpretation of what makes a good story. A non-linear story could actually be an improvement, in that it would be different every time you play and the experience would be deeper and more enthralling because of it. The Zelda series has its roots in free-roaming exploration. While the first game lacked in this department, this has long since changed, but that’s no reason for the series’ roots to be ignored. The plot can co-exist with deep and branching game-play, so don’t you think it’s time for another non-linear Zelda?